I contacted Lake Powell Paddleboards through their Facebook page before heading out to the area to make sure that I would have the opportunity to try paddling in a new location. I explored town a little before checking into the motel and came across their store. They were very welcoming and not only helped me pick a board for use later in the week, but also helped me to map out all the tours that I wanted to go on and offered a few suggestions. Being navigationally impaired, it was great to have a sense of where everything was after being in town 10 minutes! We decided on a WatersEdge board that was fantastic! Jordan and Joe have paddled in 46 states (time to expand your list Frank) and with their experience and equipment knowledge, they can set you up right. Whether you are renting, buying or looking for a tour, stop in and check out their shop. Tell them Katie says hi! 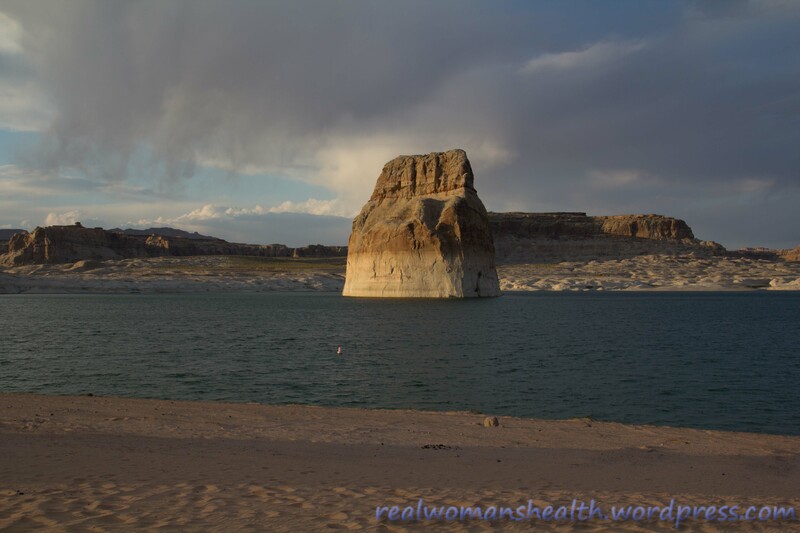 In one of my discussions with Lake Powell Paddleboards, they told me that the sunsets out at Lone Rock are fantastic. I drove the 3 minutes to the store and they set me up with a car rack, a paddle, a leash, a life vest, and, of course, a board. They reviewed the directions with me and made sure that I was comfortable handling the board and the rack system. It was a very cool area, 15 minutes away and across the border into Utah. You drive up onto the beach where people are also camping. I easily got the board off the car and down to the beach. I pushed off towards the rock and noticed a bit of a wind. After an experience I had a few weeks ago, wind makes me a bit nervous. When I stopped to take a picture about half way to the rock, the wind picked up and spun me back to shore. Having learned my lesson, I decide to listen to the wind. It was kind of cool riding the wind and waves back to shore. The only issue was that I was blown quite a bit beyond my launch point. Carrying a board in strong winds, across sand, is a great workout. A young man from Salt Lake City who was camping, helped me get the board back to the car and held it down while I strapped it in. A volunteer at the park stopped by and told me about movies that had been made in the area (Avatar, How the West Was One), and told me great stories of some of the crazy stupid stuff he has seen people do over the years. The sunset was beautiful! To visit this canyon, you need to schedule a tour with one of the operators in town. I used Overland Canyon Tours, about 4 doors down from the SUP store. They use an SUV type vehicle and limit their tour group size. My group had eight, and I believe that is as big as they get (unless you have a special request for your group). The tour takes about an hour and is not physically demanding beyond just being on your feet and walking. Every tour group has a 2 hour option for photographers that want to set up tripods. Shauna was our guide and was fantastic. It is not a photography workshop, but she gave a few suggestions on camera settings and they worked out well in both the upper and lower canyons. The Upper Antelope Canyon tends to get crowded. Part of the reason for the crowd is that once a group gets to the end, they have to turnaround and walk back through to the start. If you are looking for the “famous” light beams, this canyon seems to be the place to go. Many canyons in the area have the beams of light but they may last a shorter length of time and be less numerous. Call and ask about the best times to see the lights. The colors can be amazing and change as the light shifts throughout the day and with even slight changes in camera settings. *All photos taken inside the slot canyons cannot be used for commercial purposes unless you get a special permit. Please respect tribal and federal law and do not copy for commercial use or advertised page. See the new Canyon Gallery page!! The Lower Canyon is virtually across the street from the upper. There is only one company that provides tours to this area. To take a tour, just show up, pay, and wait for the next tour to leave. Some days they are really busy and you may have to wait a little. So, if there is a specific time that you want to go, you may wish to show up a little early. Photographer passes are for 2 hours and you are pretty much on your own to explore the canyon. There are guides and monitors that are around to make sure you are okay and answer any questions. I took the one hour guided tour and loved it. If you want to set up a tripod, take the 2 hour pass. My first night in Page, I headed out to Horseshoe Bend to catch the sunset. There is about a 1/4 mile hike involved. The soft sand and steep angle make it a little challenging, especially on the way back. It was really windy but oh so beautiful. Does anyone know how to get sand out of a camera? Red Rock Motel is on 8th Street/The Street of Little Motels. Pamela and Brady are the owners and live down at the end of the Motel. They really take care of their guests. If you need something, just ask. My room had a full kitchen, complete with pots, pans, plates, and utensils. It was essentially an apartment with a patio. They also have 2 and 3 bedroom suites. The room rates are great and the money I saved by not staying at one of the big chains, payed for everything else I did in Page. I felt right at home in my room but if you are looking for luxury with a mint on your pillow or a free breakfast, this is not your place. If you are looking for a comfortable, well priced place with friendly staff, this is your place! If they are full, I would try one of the other motels on the street. From my interactions and from what I saw, the owners are honest and helpful. One place did tell me that they did not have a room that was a great fit for what I was looking for and referred me to Red Rock. I heard Pamela trying to help out a few travelers looking for rooms on a night that Red Rock was full. I was asked several times where I was staying and without fail, I received a smile and assurance that they would take care of me when I mentioned the Red Rock Motel. The tour started in her beautifully and thoughtfully decorated craft room separate from the house. There was an amazing photo of her posed out in canyon country, dressed in an outfit that she had made. In her craft room and throughout the house, she had perfectly maintained antiques from her grandmother. “If you’ll step back this way, you can see…” This room had some pieces that were handcrafted by Navajo artisans. Here, you could also see the hat she wore while giving tours in the canyons. As the tour was ending and we headed back out, she pointed out the hats that she had “made” her husband wear when he worked in the tour office. After the tour, she shared a few more stories and made sure that I had spoken to some people in town for recommendations on what to see. I assured her that I had. I thanked her for the tour and sharing her home with me. We exchanged a warm hug and wished each other well. May you find such a kind and passionate tour guide on your path. Do NOT depend on your phone for the right time. My watch and phone did not always agree. As you travel in the area, check with were you are going for the correct time. After living at sea level for over 20 years, the 4300 ft elevation was a bit of factor in some of my activities. Please consider this while making your plans. Drink plenty of water. I am used to hot, so that was not a problem. It was the dry that threw me off. Be aware that you may not notice how dehydrated you are getting because it is so dry. Sand can and will get into everything not protected. I may have to take my camera in for a good cleaning. My shoes will forever carry Arizona sand. 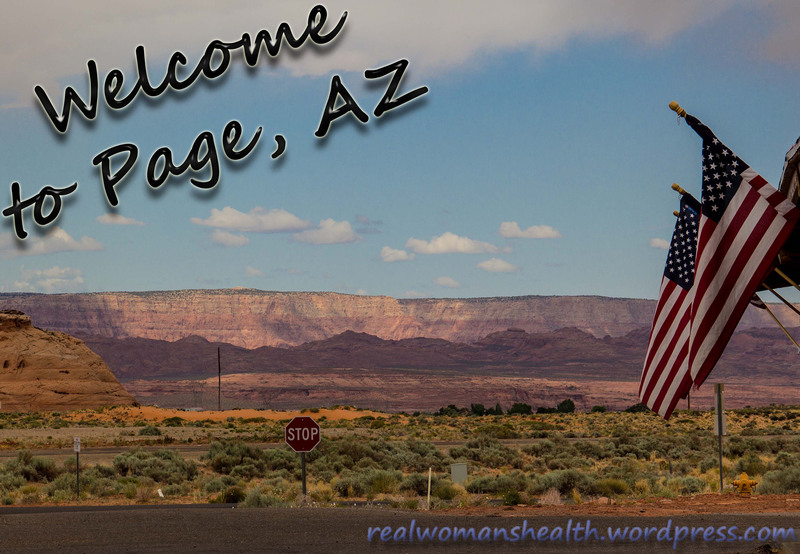 This entry was posted in Life, Photos and tagged Antelope Canyon, Arizona, Horseshoe Bend, Lake Powell, Lake Powell Paddleboards, Page, Red Rock Motel, slot canyon, SUP, tours, travel. Bookmark the permalink. Great photos and such an exciting story! Thank you! Thanks for coming by. Wow! Great stories and stunning photgraphs! A true adventure I’m so glad you shared. That sounds like a fun vacation! How did the board compare to yours? It was a little more stable and glided better. It was not quite as nimble but it was a longer board by a few inches so I suppose the difference could be explained by that. The nose was cut sharper and angled up more. I would like to get it on the springs here so I could be more scientific about the comparison. Most excellent for you! Arizona is beautiful. I’ve been there twice, and hope to go back one day. Thanks for sharing your photos and story! It is nice to get away. I just got home from visiting family in Michigan. We went to the beach on Lake Michigan. It was beautiful!